The Holden Captiva is a grandpa in automotive years, having been with us for 12 years since its 2006 debut. 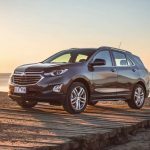 Mercifully, it has been put out to pasture and succeeded by the 2018 Holden Equinox, which does not come from South Korea as its predecessor, but Mexico. 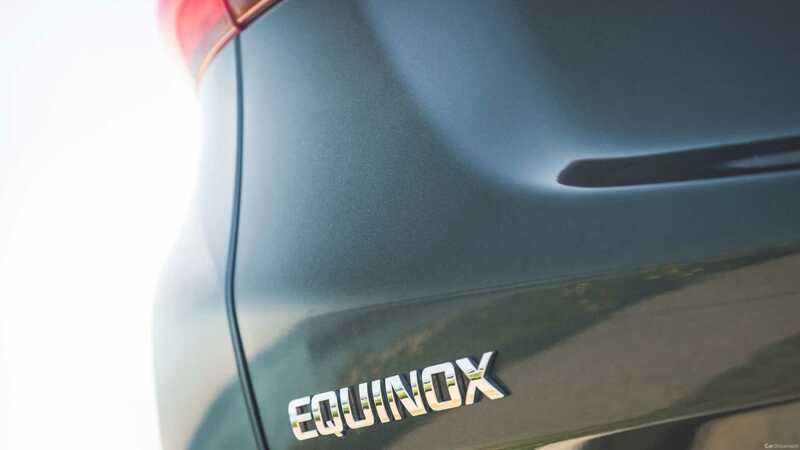 Equinox’s drawcards include larger-than-class-average dimensions, excellent fuel economy and some of the most powerful engines in its class, with two turbo petrols and one turbo-diesel available. It is front- or all-wheel drive but is a strictly five-seater only affair. 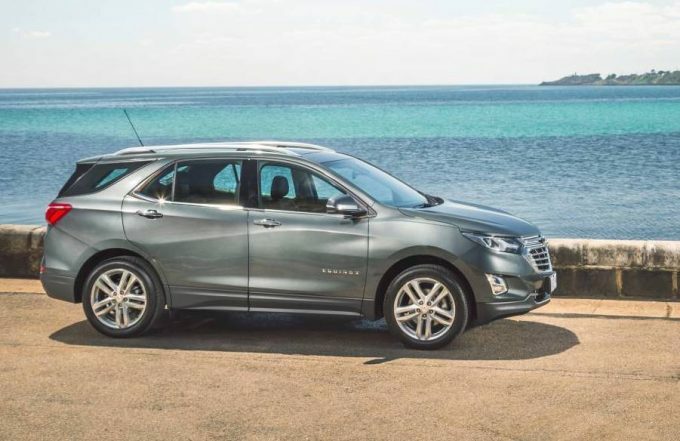 The entry-level Equinox LS starts at $27,990 before on-road costs for the six-speed manual, or $29,990 for the six-speed automatic, but we have the $32,990 LS+on test, which has some additional safety features included too. 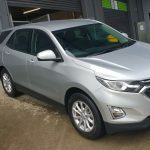 For an opener, it comes very well equipped, with push button start, keyless entry, 17-inch alloys, power windows, Apple CarPlay and Android Auto touchscreen, digital speedometer, to name a few items but we will expand on that later. With every manufacturer baying for blood in the medium SUV category, how does Holden’s newly-repatriated Mexican fare? The Equinox measures 4652mm long, 1843mm wide, 1661mm tall and has a wheelbase of 2725mm. Bootspace is 846 litres with the rear seats upright and 1798L when they are folded. Towing capacity is up to 1500kg braked. For every passenger, the Equionx makes excellent use of space, most notably with a flat floor at the rear. It’s a genuine five adult seater and the seats are very comfortable. We liked the countoured trim pattern and clear dials. Seat height is nice and tall, with excellent forward visibility and good back support from the seats. 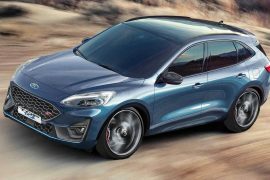 The 7.0 inch touchscreen will be familiar to anybody who’s driven a Spark, Barina, Astra R or Colorado. It utilises Holden’s MyLink system, which still looks nice with its blue background theme and legible icons. 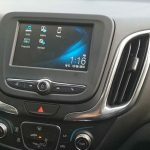 It contains Apple CarPlay and Android Auto functionality, as well as the ability to display map apps on the large screen. Higher series models get a larger screen with integrated satnav, but this one will suit most people fine. There is a smaller screen in the instrument cluster which displays digital speed, fuel consumption and other data. 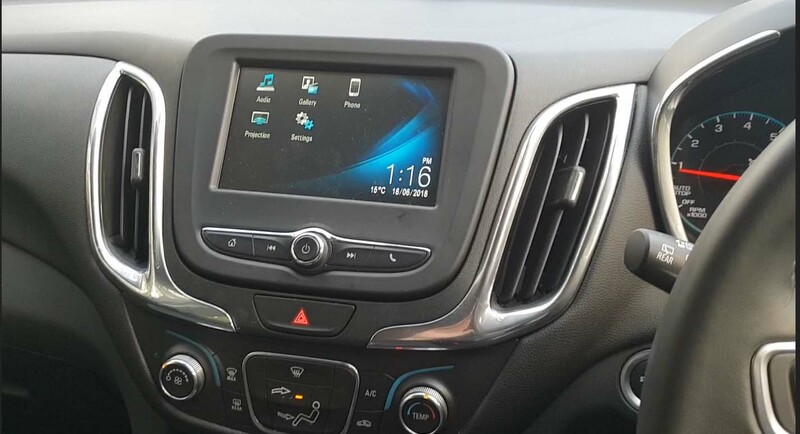 Being a global SUV, but primarily geared towards the American market, the Equinox does have some ergonomic quirks, such as the +/- push-button on the gear lever as well as radio volume and tuning buttons behind the steering wheel. Once you’re familiar with the location for these, they fall readily to hand. The climate control is easy to operate and comes to life quickly. Sound quality from the six speaker sound system is better than expected, with great bass, no real distortion but we’d stop short of calling it exceptional in terms of crispness. The Equinox exterior aesthetic can best be described as fresh, contemporary but inoffensive. The subtle character lines and ‘Equinox’ lettering along the side of the broad, expansive body work well. The derivative rear taillamps and corporate grille, less so. While not as sporty or adventurous as some rivals, it’s a welcome departure from the long-in-the-tooth Captiva. 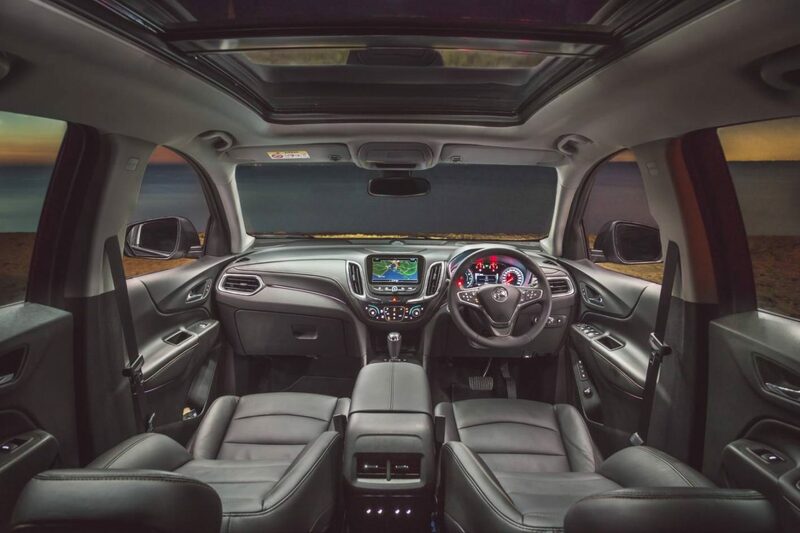 Equinox’s interior is reminiscent of the Astra Sedan (nee Cruze), with which it shares General Motors’ D2XX architecture. That means large vertical vents surrounding the touch screen and good quality plastics almost everywhere you care to touch. Visibility, as a function of design is great all round, with the reverse camera and rear parking sensors a handy ally in the car park battleground. The 1.5-litre turbocharged petrol four-cylinder in the Equinox LS is an impressive unit for an entry-level midsize SUV. It develops 127kW@ 5600rpm and 275Nm between 2000-4000rpm, propelling the 1514kg wagon from 0-100km/h in the 8.0-second region, which is great for a base engine. 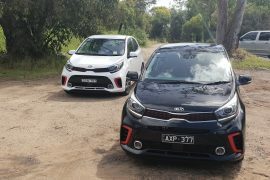 It is responsive, lag-free and while it doesn’t sound particularly sporty, it definitely moves along better than we expected and much better than some rivals. Kudos to Holden here, although the stop-start system definitely blunts off-the-mark progress, so you have to make a split-second allowance when pulling out. Unfortunately, we couldn’t find a way to turn it off. 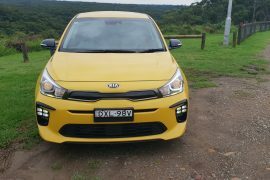 Further up the range in the $39,990 LTZ upwards, theres a 2.0-litre turbo engine available, which has 188kW and 353Nm. The performance of this model is outstanding and up there with class best. We think there is a solid foundation here for a HSV model in the future. 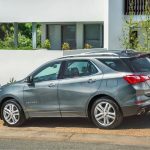 The Equinox LS+ we tested had a six-speed automatic gearbox, which was well-matched to the engine, never indecisive and always dropping back and holding gears in accordance to the terrain and gradient it occurred. Can’t fault the way it operates, except for the annoying +/- button on top of the gear selector. This might be preferred in America (for some reason), but doesn’t lend itself as well to enthusiastic driving as a normal, gated setup or better still, paddle shifters. Nevertheless, we are grateful it doesn’t have a jerky dual-clutch gearbox or doughy CVT. Models specified with the 2.0-litre turbo unit score a nine-speed gearbox, to further make the most of available torque. A six-speed manual is also available on LS. 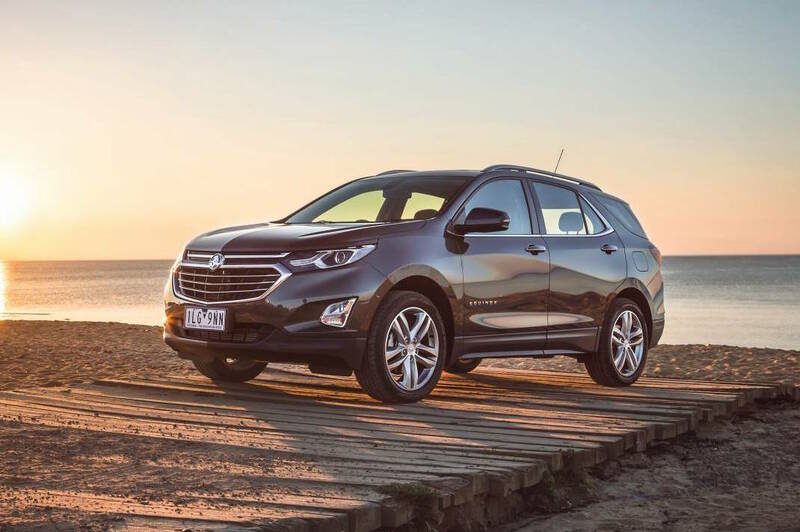 With local input from Holden’s engineers on the Lang Lang Proving Ground, the Equinox is suitably composed at all times, never feeling nervous, ponderous or floaty. On the plus side, the steering calibration makes the car feel much smaller than it is, for ease of parking and maneuverability, but it doesn’t offer much in the way of feel when you press hard into snakey territory. Wind noise and engine noise are well-contained and sealed off. It absorbs most bumps with aplomb, but it must be said that low-speed ride was a bit terse for a high-riding car. Even when given a bootful, the engine never became thrashy, just rising in timbre with a faintly- perceptible turbo sound entering the cabin. The quoted mixed figure of 6.9L/100km looks impressive on paper, beating a base model Hyundai i30 small car, and in the real world, it achieved 8.5L/100km in mixed conditions with a somewhat leaden foot. Pretty good considering the performance, roominess and versatility of this midsize SUV. For the record, the stonking 2.0-litre turbo is rated at 8.2L/100km for front-drive models and 8.4L/100km for the all-wheel drive equipped variants. The 1.6-litre turbo-diesel engine is available for those who want something a bit thriftier at 5.6L/100km. Services are carried out at an unusual 12,000km interval, which splits the difference between most manufacturer’s 10,000 or 15,000km offerings. The first few are capped at between $259 and $299 and climbs up to as much as $399 for more major scheduled appointments at the 48,000km mark. Par for the course these days in a modern vehicle and quite reasonable in our opinion. The LS+ adds some important safety features to the LS’s generous equipment list. These include Autonomous Emergency Braking (AEB), lane keep assist, lane departure warning, following distance indicator, bline sport alert, rear cross-traffic alert, automatic high beam, folding exterior mirrors and a head-up LED warning light for the forward collision alert system. These safety features are definitely worth having in this distracted driving world, but the basic package manages a 5 star ANCAP rating, regardless of model choice. Reassuringly, brakes were more than up to the task, pulling up the car flawlessly every time, which is better than we expected from a non-performance oriented model. As mentioned in the opening paragraph, both the LS and the LS+ are well-equipped with no air of “bargain basement” about them whatsoever. 17 inch alloys, reverse camera with guidelines and parking sensors, auto headlamps, active noise cancellation on automatic cars, Apple CarPlay and Android Auto, USB and keyless entry/ start are pretty sweet additions for a car which starts at under $30,000. The extra safety kit in the LS+ only adds icing to that tasty cake. 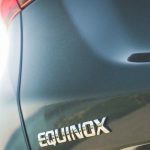 Equinox also has a seven year/unlimited kilometre warranty with free roadside assistance at the time of writing, putting it on par with industry best, Kia. 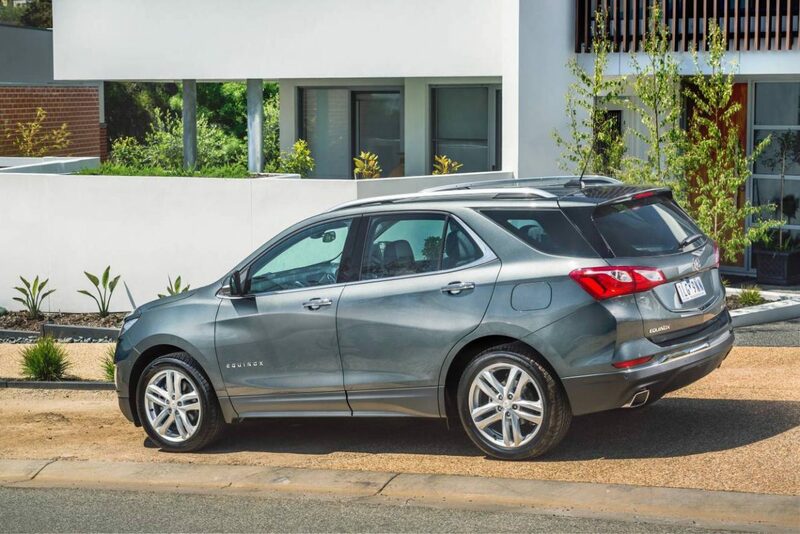 Equinox fills a much-needed gap in Holden’s range that the ageing Captiva was no longer able to. Build quality, engine performance, economy and handling are all better than we expected. 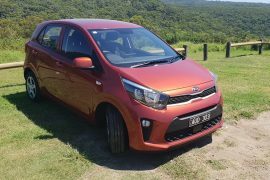 What it lakes in cutting-edge design flair it certainly makes up for with a very generous standard equipment list, while its flaws are limited to the stop-start system and maybe the only disadvantage over its predcessor, no 7-seater option. If you require that, you’ll have to graduate to the next-size-up Holden Acadia that is due here very soon. While not presently at the sharp end of the SUV Medium segment sales-wise, the ingredients and execution are sound, so it’s worth a look.